Catfish is one type of fish that is quite popular in Indonesia and readily available, either in the village or town. There catfish that live in the wild and some are cultivated. Catfish have distinctive characteristics with his slick, slightly flattened and elongated mustache similar mimiliki long, sticking out around the mouth. Some types of catfish have been cultured people, but most species caught from wild populations in the wild. African catfish are popular as farmed fish, is actually a kind of imported alien (introduced) from Africa. Catfish are nocturnal, which is actively engaged in search of food at night. During the day, catfish silent and shelter in dark places. 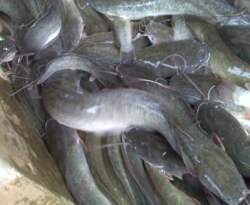 Catfish has a distinct advantage compared to other types of animal products, which is rich in catfish Leucine and Lysine. Leucine (C6H13NO2) is an essential amino acid that is necessary for the growth of children and nitrogen balance. While Leucine is useful for an overhaul and the formation of muscle protein. Lysine is one of the nine essential amino acids needed for growth and repair jaringnan. This amino acid is very useful for growth and bone development in children, helps the absorption of calcium and nitrogen balance in the body, and maintains a child's body that is not too fatty. Lysine is also needed to produce antibodies, hormones, enzymes, and the formation of collagen, as well as tissue repair. In addition, Lisin also useful to protect children from cold sores and herpes virus (Wikipedia). Based on the scientific study of catfish has a high protein content in it is about 17%, not only that this fish also have a wide range of fatty acids, which can meet the essential fatty acids daily kabutuhan us about 9%. But limit your intake of fish, because the cholesterol content is also quite high. 1 day 2 tail is sufficient to provide a lot of benefits. In addition, channel catfish also believed to strengthen the abdominal muscles, treating diabetes, impotence, hepatitis, ambient and eczema. How to use is very easy, simply cooked / boiled then eaten or burned, charred, and in finely crushed and made powder, pour in hot water and drunk. In Indonesia, catfish bred for consumption and also to maintain the quality of contaminated water. Often catfish placed in polluted places because it can remove impurities. Catfish were placed in dirty places must "diberok" first before it is ready for consumption. The purpose of the "diberok" ie catfish maintained in running water for several days in order to clean it. Sometimes catfish are also placed in the field by eating pests in rice fields. Catfish are often placed in the pools or places other stagnant water to cope with the growth of mosquito larvae.